7-Ethylcampothecin (7-ECPT) is a derivative from natural campthecin, a cytotoxic quinoline alkaloid originated from camtotheca acuminata or Nothapodytes pittosporoides(Mappia).Camptothecin was discovered in 1966 by M. E. Wall and M. C. Wani in systematic screening of natural products for anticancer drugs. 1. 7-Ethylcampothecin with purity 99% by HPLC,in house standard. 1. 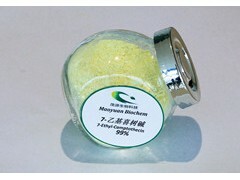 Single impurity of 7-Ethylcampothecin: less than 0.5% generally, <0.1% as required. 3.13000 square meters production area and more than yield of 50kg 7-Ethylcampothecin per month. 7-Ethylcampothecin showed remarkable anticancer activity in preliminary clinical trials by inhibiting the DNA enzyme topoisomerase I (topo I). 1. 7-Ethylcampothecin is one of the natural starting material of Irinotecan HCl. 2. 7-Ethylcampothecin is the natural starting ingredient of 7-Ethyl-10-Hydroxycamptothecin(SN-38). 3. This compound (S)-7-Ethylcampothecin is a featured product for Apoptosis research.